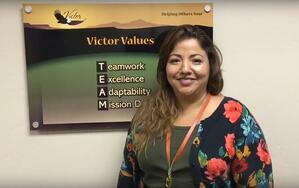 Recently, the staff at Victor Hemet came together to talk about the culture and values of Victor. Joseph Olvera, from our Lake Elsinore office, helped them tell their stories and illustrate them in a unique and creative way. It's always great to see our staff having fun and celebrating the culture that Victor promotes! What is the Culture Like at Victor Hemet? 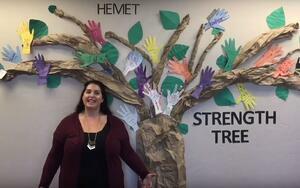 Danielle Dominguez shared a special thing they have done at Victor Hemet that illustrates culture; they created a strength tree. Each employee traces their hand print and puts their top five or six strengths on them. All of the hand prints have been added to a large tree created on the wall of the entryway. Aside from being a creative outlet, it also reinforces each employees confidence in their own strengths and gives perspective on the combined strength of the whole group. Yobana Muñoz says that there are a lot of things that make Victor Hemet special. They treat each other like family, so that even when they are at work and away from home, they have a sense of kinship and mutual support. She feels fortunate to have such awesome coworkers, saying "I'm always connecting with them and we always talk about our cases and everybody's so open and friendly." One special thing that they do at Victor Hemet, which Yobana is actually in charge of, is making welcome signs for new employees and also giving them the gift of a small plant which can grow with them on their journey working at Victor. Nathali Gallard had some great things to say about the value of teamwork, "We were going out into the community to do a whole lot of events. We went to different schools, spoke with different agencies and were really trying to partner and spread the word about Victor and what we provide. Even though we had a little bit of resistance at first, persistence and teamwork were the key to helping our team push our mission forward. Going out to the schools as a team has been really helpful. We get to show them what we do, day in and day out to help our clients who are struggling in school due to anxiety or anger. We create a whole support team, not just working in the schools, but also working at home, and really practicing all of these coping skills, calming techniques, and allowing our work to show for itself." 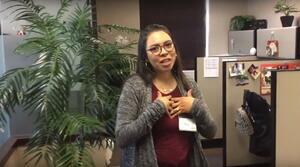 Yobana Muñoz told a great story about her interpretation of being mission driven. She believes that "tears = healing", so she's always on a mission to make her clients cry. Yobana says that, "in tears we can find healing, and in tears we can find the answers, sometimes, that these clients are looking for." Working with one of her clients, a stylish 17 year old boy, he kept telling her "Yobana, I just can't tell my dad how I feel." Yobana would always encourage him to try to use some of his coping skills. She actually encouraged him to sing a song, something that would help his father know how he feels. In the end he didn't have to use a song at all, he just mustered the courage to tell his father how he felt while they were in the car. The client's father actually joined them for the next session and told Yobana, "Yeah, he told me how he felt and he was in full tears." Yobana knew this meant she had broken through with this client and was making progress. When Yobana went back to her supervisor, she said "Boom, I made another one cry." Illustrating a point about adaptability, Danielle Dominguez told a story about finding ways to connect with a client through their own interests, even if the session was not what you had expected. In this case, Yobana accompanied Danielle to a home visit for some family therapy. When they arrived they were surprised to find the teenage son absolutely dripping with sweat. Danielle's first reaction was "I don't know what's going on here. Is this a crisis?" It turned out that the teenager was just heavily involved in a video game he was playing. He recruited both Danielle and Yobana to join him in the game. Typically this teenager had a hard time communicating or even making eye contact with people, but through the process of playing this video game with Danielle and Yobana, they began to establish some rapport. This was the most engaged they had ever seen him and by the end of the game he was actually having a full conversation with them, for the first time ever. 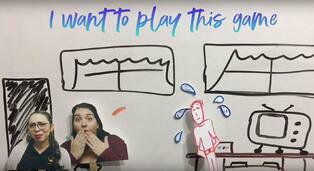 While we can't say that playing video games would be an expected activity during a family therapy session, in this case it was a door to establishing a connection with this client, a place to start. At Victor, our mission is to be a catalyst for sustained improvement in the lives of those we touch. Our core values help us achieve that mission. 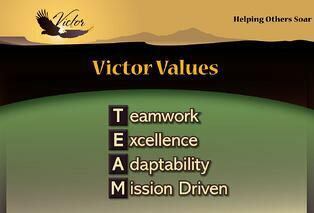 Those values are Teamwork, Excellence, Adaptability and Mission Driven (TEAM). Do you have stories that illustrate these values at work? Share them with us! If our mission resonates with you, consider a career at Victor. Click below to search current career opportunities.